Nathan is married to Kelsey and is Director of Network Relations for the Pillar Network, an SBC Church Planting and Revitalization Network of churches. Jonathan is married to Ashley, and they have two daughters, Maddy and Emma Grace, and one son, Judson. He is the Director of Young Leader Engagement for the North American Mission Board and has a PhD in Old Testament from The Southern Baptist Theological Seminary. Paul is married to Kari, and they have one son, Micah Elliot, and three daughters, Jordan Kate, Kai Elizabeth, and Skylar Lei. He has a Ph.D. in Missions from Southeastern Baptist Theological Seminary. Tim is married to Anna, and they have four sons, Levi Michael, Judah Daniel, Caleb Wesley, and Ezekiel Mark, and one daughter, Shiloh Joy. Tim is pastor of FBC Douglasville, GA and is a Ph.D. student in Systematic Theology at Southeastern Baptist Theological Seminary. Dissertation: Bernard of Clairvaux: Evangelical of the 12th Century (A Critical Analysis of His Soteriology), 1989. Master of Divinity, Southwestern Baptist Theological Seminary, 1983. Bachelor of Arts in Biblical Studies, The Criswell College, 1980. 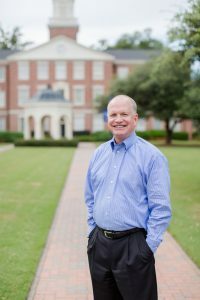 President and Professor of Preaching and Theology, Southeastern Baptist Theological Seminary, 2004-present. Professor of Theology and Christian Preaching, The Southern Baptist Theological Seminary, 1999-2004. Senior Vice President for Academic Administration, The Southern Baptist Theological Seminary, 1996-2004. Dean, School of Theology, The Southern Baptist Theological Seminary, 1996-2004. Associate Professor of Christian Theology, The Southern Baptist Theological Seminary, 1996-1999. Associate Professor of Theology and Dean of Students, Southeastern Baptist Theological Seminary, 1992-1996. Professor of New Testament, Theology, and Church History, and Dean of Students, The Criswell College, 1988-1992. The Southern Baptist Journal of Theology (Executive Editor, 1997-2004). Criswell Theological Review (Associate Editor, 1989-92).